Value: who knows? it’s a liqueur! I ran into this stuff at a bar on Oahu while on vacation last year. I loved it so much that I had friends back home run out and buy it for me. There are very few liqueurs that I care too much about. In our house, Creme de Mure is the most important liqueur, followed by Combier/Cointreau/Triple Sec. These are indispensable and absolute *must haves* if I’m tending bar. So, lumping in a third into this indispensable class is pretty big deal. As this is my first liqueur review, I’m sort of struggling with my signature “let’s not mince words” proclamation. But let’s try this on for size: Domaine de Canton is your one-stop-shop for ginger flavor. I am not a fan of flavored hard stuff. The closest I get is when I or a friend infuses hard stuff at home; like homemade Vanilla Vodka, Vanilla Bourbon, or Pineapple-Cilantro Tequila. So, when I add flavors to a cocktail, I tend to add in the real deal. Hence, me making my own Tincture of Sweet Ginger, and Ginger-Orange Bitters. (Yes, I’ve home made two different ginger spirits. “Ah,” says you, “Now I see the desire for a ginger liqueur…”) I’m a fan of pure spirits and potent flavors being separate. I get better control over my results that way. Domaine de Canton is my go-to for ginger flavor in cocktails. I’ve already written up two different cocktail recipes that feature Domaine de Canton, but didn’t want to post them until after I posted this review. So, you have more BoozeGuru Originals coming your way soon! Ok, the flavor profile. Now, the manufacturer proudly claims that this stuff contains VSOP Cognac. I don’t taste it. What I do taste is honey, refined sugar, ginger, and a touch of vanilla. Could the hint of vanilla be the traces of cognac in the bottle? Possibly. Or: they added vanilla flavor (which they did). They also claim to have added ginseng… which is believable, but not really verifiable as the ginger clobbers any subtleties of flavor. Your one-stop-shop for ginger flavor. I don’t mean to come across as if I’m bashing this liqueur’s manufacturer/distiller. I really don’t. I like this stuff and I think they’ve done a great job in concocting it. It’s just hard to justify adding in cognac and ginseng when the ginger flavor is so overpowering. You’re probably wondering what I meant when I noted that the finish was “deceptive” at the top. The taste is sweet and gingery, but it doesn’t burn the tongue. What does burn is the finish. I’d even go so far as to compare it to that “whiskey burn” I go on and on about… but it’s a different burn. Taste it yourself to get my full meaning. Now I need to be clear about something: I love ginger. I eat crystallized ginger all the time. So a ginger-based liqueur is right up my alley. If you are not so root-spice inclined (yes, I also love horseradish and wasabi) this may not be the liqueur for you. Still, this stuff is handy. When I get a head cold, I drink hot tea with honey, Bourbon and lemon. It usually clears everything up quickly. Well, I *now* drink hot tea with honey, Bourbon, Domaine de Canton, and lemon. It tastes fantastic, soothes throat, and calms my cough. 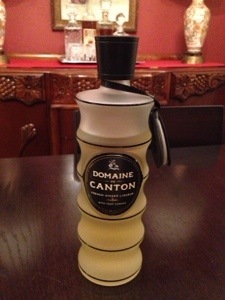 Another quick hit: one ounce Gin, one ounce Domaine de Canton over ice. Warms you up and cools you down. For the moment, I’m leaving my usual recipe section blank. But soon, I’ll come back and edit in the cocktails I’ve created/customized for this unique liqueur. …now doesn’t that leave you wanting more?